I always come prepared when I travel. And I also make sure that I have my first-aid kit and my over-the-counter medicine with me at all times. Of course, I also pack ready-to-eat snacks for emergency purposes. But on normal days, are you prepared to tackle any disaster-related situation when one finally strikes? Well, I am! We all know that disaster strikes when we least expect it. The question is, are you willing to get caught in the storm unprepared? As for me, I don't want to take any chances. You can actually make a contingency plan by building your own "Grab Bag" for starters. 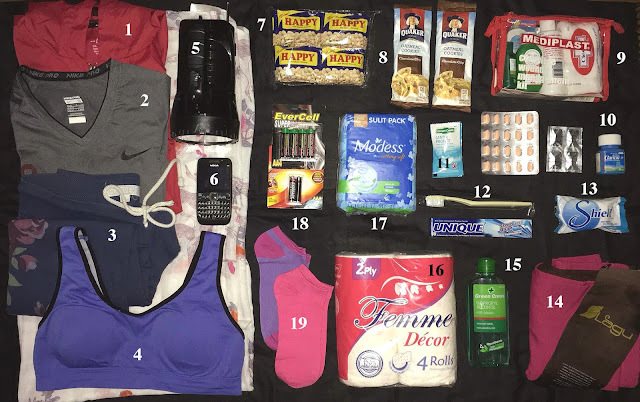 A Grab Bag consists of basic items that should last you for at least 2 days. These essentials should be able to cover you until conditions (bad weather and other disaster-related cases) are safer. Peanuts and Cookies (7 & 8) - There might not be any electricity for anyone to use, especially when disaster strikes. So make sure to pack food that can be eaten with minimal preparation, or pack food that no longer needs to be cooked. Water (not in photo) - You can survive without food for days, but not water. So make sure to include it in your Grab Bag. Jacket (1) - Your jacket can be a great thermal wear to help keep you warm. Dry Fit Shirt (2) - If you have some, choose to pack shirts that are quick-dry. Jogging Pants (3) - You can also pack shorts. But since I get cold easily, I packed pants instead. Underwear (4) - Make sure to pack at least 2-3 pairs to give you that fresh feeling all throughout. You might not be able to take a bath for days. But at least, you'll be wearing clean underwear. Socks (19) - Come prepared with 2-3 pairs to help keep you warm. Blanket (14) - For those cold days, one can survive with a blanket in tow. This can vary from person to person. But my essentials always include a good supply of toilet paper (16), sanitary napkin (17), toothpaste and toothbrush (12), and soap (13). I no longer packed shampoo to save water because I can survive without washing my hair for days. Your First-Aid Kit (9) should contain at the very least, Band-aids, alcohol (15), antibiotics (though you might need to get a prescription for this), antacids, anti-allergy meds, a long-lasting mosquito repellant lotion (11) and other over-the-counter medicine like Diatabs and Biogesic (10). The MEDIPLAST First-Aid Kit that I bought at the grocery store was PHP170. It already comes with band-aids, gauze, paper tape, betadine, cotton and alcohol (just to name a few). Mobile Phone (6) - Make sure to charge your phone for emergency purposes. You'll never know when you might need to keep in-touch with family and friends, or call for help from the media or authorities. Rechargeable Flashlight with built-in radio (5) - I've invested in an AKIRA Flashlight that already has a built-in radio. It's best to have a radio on hand to keep updated of weather news, rescue operations, and other advisories. Batteries - Buy batteries that you can use for other gadgets that might need an extra boost of power, especially for flashlights that aren't rechargeable. You can build your own Grab Bag however you please. Just make sure to fill it up with the neccessary things that you think might come in handy for when disaster strikes.